Custom Printed Coffee Cup Sleeves - Top quality | recycled | 11.7¢ ea. Custom printed coffee cup sleeves can be produced for as low as 11.7¢ each. We offer the best service. We print 1, 2 or several ink colors on both sides. Our high-quality Eco-friendly cup sleeves contain a high content of post-consumer waste recycled fibers. We use soy & vegetable based inks for orders which require printing. Our manufacturing & printing facility is located in the USA. Our products are shipped directly from our headquarters located in California. Cup sleeves hide the message printed on cups; therefore we recommend printing your message on the cup sleeves, instead of the cup itself. Organizations looking for an effective way to brand & market their products. 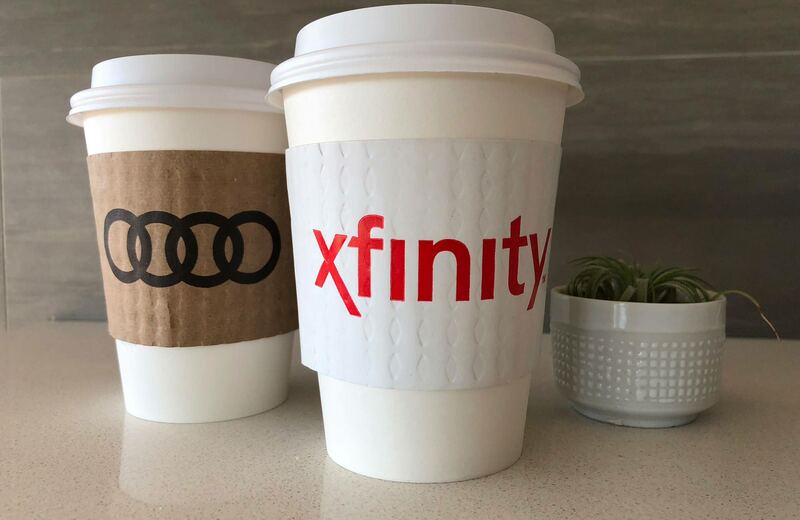 will find that custom printed coffee cup sleeves are one of the most effective & affordable marketing tools available in the market for branding and advertising. 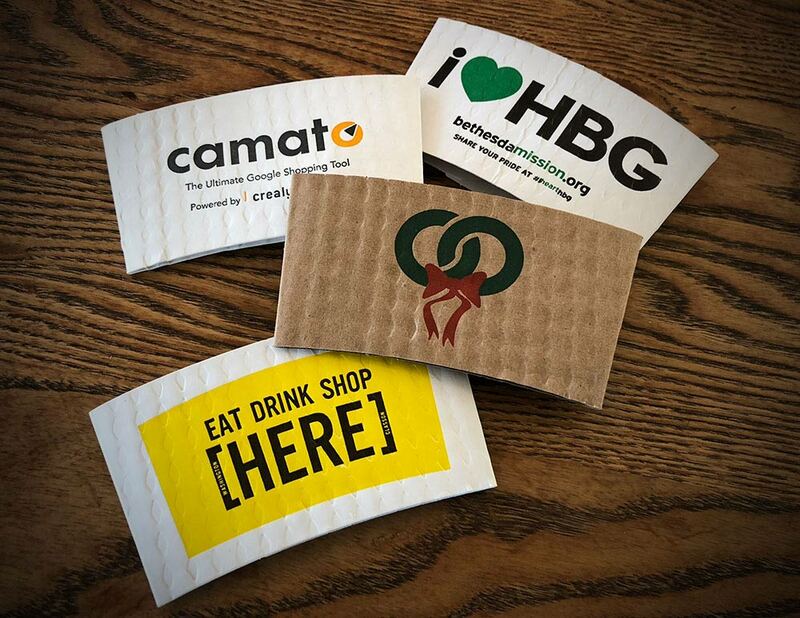 Organizations push their brand using our cup sleeves with the help of their local coffee shops. Selected coffee shops become great distributors of your cup sleeves. Coffee shops can brand for themselves, others or both as partners. Advertisers’ messages are seen and heard loud & clear unlike anything else. Messages displayed to the public throughout the city. Based on several reports it takes an individual average of 35-40 minutes to consume their drinks. Most individuals are drinking coffee, tea or some other hot or cold beverage several times daily. Displaying cup sleeves in public for 35 minutes attracts many eyeballs. It’s an easy process to arrive at a cost per view. The result will demonstrate our cup sleeves is the smartest way to advertise as it will show the cost of each eyeball. Unarguably that’s getting a great bang for your buck. Stand-alone above the rest by using custom printed coffee cup sleeves for your advertising and watch your sales go through the roof. 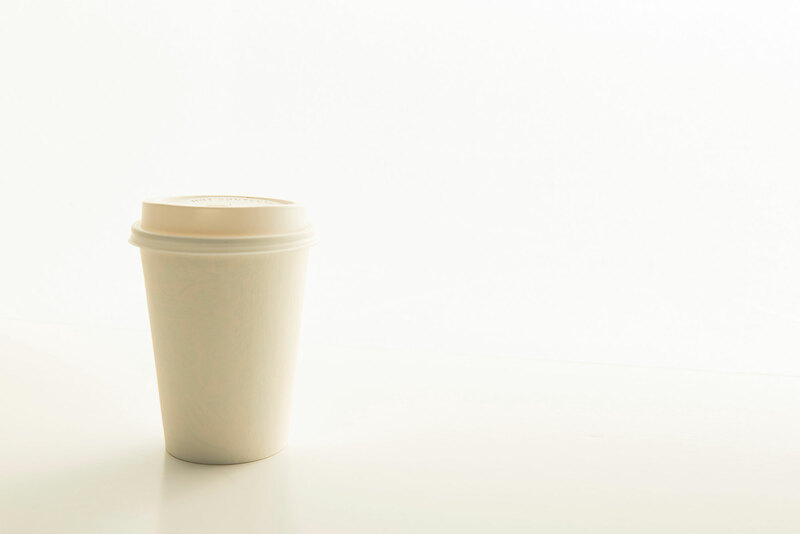 Blank coffee cup sleeves do not increase sales. Printed cup sleeves do. 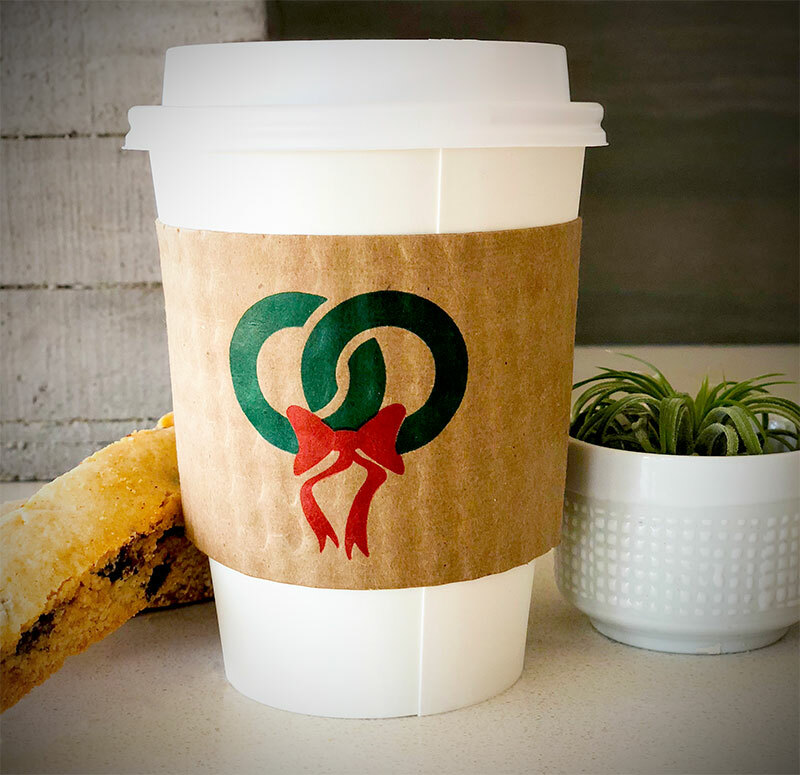 For pennies, you can print your custom printed coffee cup sleeves and allow your clients to display your message all over town. 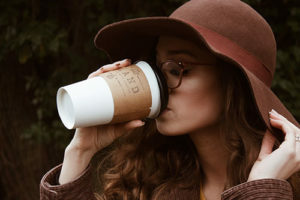 A second option available to coffee shops is that they can become an advertising partner for a third party and if the coffee shop decides to take this route they will distribute their cup sleeves printed with their messages and would receive the sleeves free of charge. The best option might be a partnership venture where the coffee shop prints its message on one side & the partner prints on the other side of the sleeve. Resulting in sharing the sleeve cost. Contact us to discuss your advertising goals. We would love to take part in your success. Lets team up, work together towards a common goal to increase your sales. I recommend Custom Printed Coffee Cup Sleeves: "Excellent custom sleeves and we always receive in a timely manner! Definitely recommend PCCS!!" Last project went off perfectly, v thanks for all your help. Will continue to look for opportunities that we can work together in the future. I appreciate you trying to come up with ideas . Just goes to show the care and attention you give to your customers. However, I think the “fix” we came up with will have to work. We got the coffee sleeves today. They look great. Thanks so much for making the order experience great. Thanks to Ed and his team for helping me create and send my coffee sleeve business cards so quickly! I couldn't have asked for a better experience. Thank you for your kind remark. Glad we were able to help. These cup sleeves are fantastic - better than expected! Thank you for creating a great product and the super fast shipping. Looking forward to future business together! They are wonderful as usual! Thank you for your kind comment. We appreciate & look forward to continue to provide you with services which you deserve. We love our sleeves just like last time. I also love that you are always so quick to help and respond to messages. Thank you. Been a pleasure. Thank you, Ed for everything! Not only was he AMAZING to work with, the quality of the product was impeccable. I was in a bind and had to do a rush order. Ed came to the rescue! He was courteous, professional, and went out of his way to make sure we got a great product ON TIME! I highly recommend using this company! Thanks again! Thank you Ann. It was a pleasure serving you. Thank you for my lovely sleeves! Will order more soon! Thank you looking forward to be serving you. Amazing company!! This is where my coffee shop has gotten its sleeves for the past seven months now, and after seven months, I feel like the least I can do is give them a 5 star review and a 10 star recommendation. Ed and his company will take absolute care of you. He seems to be a wonderful person, and that definitely deserves recognition. Thanks Ed! I get emotional as I read your very kind comments. Thank you. My partner Ben & I are only doing our jobs as well as we know how. But the real trophy should be going to you & the rest of our clients. Without you we would not even be around. That said please let us know how else we can improve our business so we can better serve you. Wishing you continuous success & we are glad to be a part of it. Thank you for the kind remarks. Been a pleasure serving you. Ed was a pleasure to work with and gave me excellent service. Our coffee cup sleeves arrived right on time and were exactly as we ordered them. We have ordered from him several times and each experience has been great! We will continue to do business with his company! Thank you for the kind remarks. We will continue to serve you with the same enthusiasm for as long as you'll allow.